If your teens write well, helping them to start their own blog can be a great way for them to earn extra money. They can make money on ads, sponsored opportunities and more. They will need to be a little bit computer savvy but this shouldn’t be an issue since most kids and teens already are these days. If you have a crafty teen, they can make extra money by crafting items and selling them on Etsy. Etsy is great for anything homemade or vintage so they could easily build themselves a successful business before they ever graduate high school. Most teens (at least teenage girls) love to shop so what could be better than hitting the thrift stores and selling their finds on Ebay. They can start in their own closet to earn funds to begin with then invest the money they earn into buying more items. Before long they could be making quite a bit each month! Babysitting can be a great way for teens to earn extra money. Make sure their rates are reasonable and that you always know where they are when they are sitting as well as pre-screening the people they will be sitting for because of safety reasons. They can place ads in the newspaper, in Facebook groups on or Craigslist and screen their clients from there. Survey sites like Swagbucks, CashCrate and InstaGC often allow kids as young as 13 to do surveys or win points for searching. Your teens can use these sites to earn Paypal cash or gift cards for themselves. If your teen already likes to read, this one is perfect! They can sign up for an account on Bookscouter.com and sell books they already own or ones they can find at thrift shops and yard sales. If your teen excels in one or more subjects in school, they can earn extra money by tutoring younger kids that need help. Place ads on Facebook and Craigslist and make sure they don’t forget any local home school groups as well. Fiverr is an awesome site where creators do “gigs” for as low as $5.00 each, or more. They can range from something like proofreading an article to doing something silly in person. 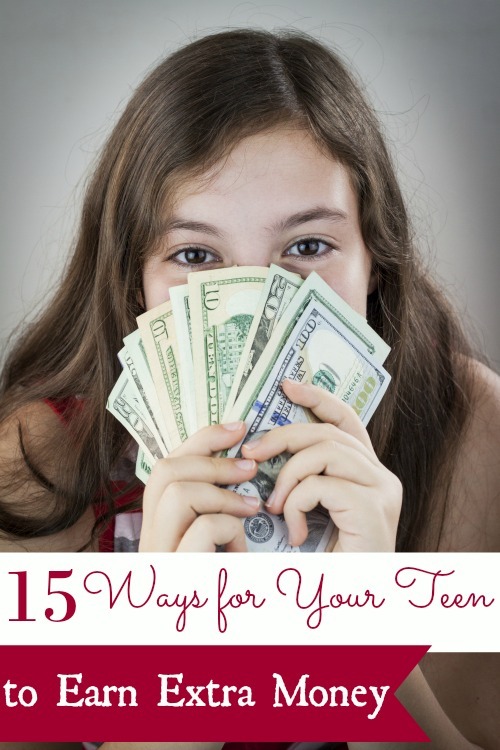 In any case, at $5.00 and up per gig, your teens could earn a nice, tidy sum pretty quickly. Are your teens good at photography? Why not create stock photos and sell them? Sites like Depositphoto.com allow you to sell the ‘rights” to your photos so that news agencies and other sources can use them. If your neighbors, friends or family are going on vacation, your teen can earn extra money housesitting for them. All they would have to do is make sure plants are watered, that the house is safe and locked up and feed and water any pets that the owners might need taken care of. Along the same lines as housesitting is pet sitting. When people travel or work long hours, they sometimes need help with their pets. Your teen can earn extra money by feeding, watering and walking pets for them so that they still receive the love and care they need while their owners are away. Cleaning homes for a living can be a great way to pick up extra money. You’ll need to help them buy supplies to get started, but since people will pay up to $50 per room depending on your area this weekend gig could be a very profitable one. Do you have a carpet cleaner? If so, teach your teen how to use it and the best way to remove stains and let them go to work! They can advertise online or around the neighborhood and charge by the room for their services. Once they get a few great reviews under their belt, they’ll have a full-fledged business on their hands. Moving is both physically and mentally stressful and a great time for your teens to earn money. They can assist with packing boxes, loading and unloading trucks and more. As long as they do quality work they can work for others as well to help them move to earn even more! Moms, especially single moms, often run themselves ragged, but having someone to help is lifesaving. If your teen is looking to earn extra money, they could get work as a Mom’s Assistant. This one is more suited toward older teens though since they may be running errands, cooking meals or helping to entertain a tired two year old.